LUCY BURDETTE: Our guest today, Liz Mugavero is a member of Sisters in Crime New England and a two-time graduate of Seascape Writers Workshop. That's why we're especially thrilled to invite her to talk about what led to her first published mystery! 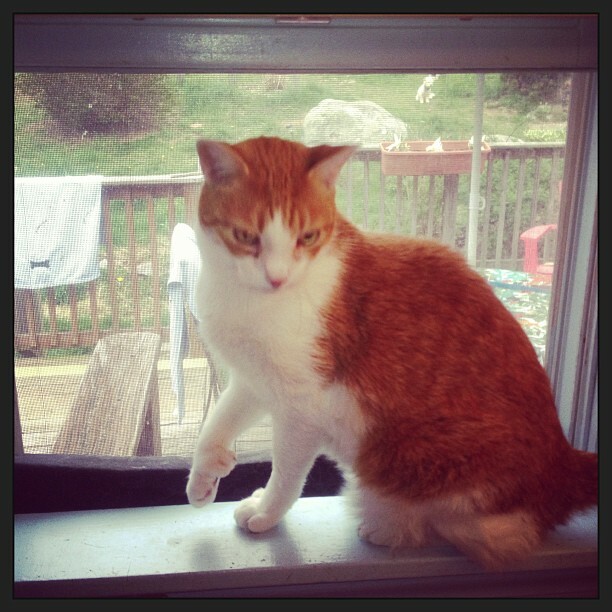 My journey into the world of organic food and alternative medicine for my animals began ten years ago with a sick, double-pawed cat named Tweetie. I met Tweetie about a week after I began volunteering at an animal shelter in New Hampshire. He had been brought in by a family who hadn’t bothered to get their two cats fixed. Before they knew it, they had a family of 25 inbred cats - and the family was threatening to grow. My shelter stepped in to help them, and took a number of the cats and spayed and neutered the rest. But Tweetie, only nine months old, came in very ill and was immediately put in quarantine. He had a chronic upper respiratory infection. His eyes were red slits, his nose had to be soaked with warm washcloths daily so he could breathe and his face was always covered in goo. But he was the sweetest cat I’d ever met, the four I had at that point aside. I kept asking what was going to happen to him. No one could tell me. They figured they would just keep giving him antibiotics until he improved, and then put him up for adoption. He was sure to face a long, hard road in that realm, though. People didn’t usually come clamoring at the doors for chronically sick kitties. My shelter didn’t euthanize animals, so I didn’t fear for his safety, but I feared for his happiness. I worried he would be stuck living in a cage for a year, waiting for the perfect home. He was too happy for that, despite all he’d been through. I went home and had a talk with my four babies. I told them they were going to get a new friend who needed some TLC. My girls ignored me. My one male was all for the idea, figuring he might have an ally, finally. So I let the shelter know I intended to adopt him. I waited (impatiently) for him to finish his medications, and they finally released him to me. Tweetie went home happily, despite his chronic coughing, sneezing and runny eyes. He made friends easily and didn’t cause any problems. This little cat didn’t have a mean bone in his body, and I swore I would find a way to help him. So I started searching for other ways to treat his problems. And then I found Dr. Martha. She appeared in a search I did for homeopathic medicine, something I’d always been interested in but never looked into before. Her practice was called Alternative Veterinary Services, and she was fairly new. It was her second career. She’d spent twenty-five years as a regular vet. I called her and explained the situation. She sent me a number of complicated forms to fill out and scheduled me for a two-hour appointment. When Tweetie and I arrived, he wasn’t nervous at all. Her office wasn’t anything like a regular vet’s office. It was more like a living room, since she didn’t use any of the tools traditional vets used. We talked about Tweetie’s history, she observed him and did a physical exam. Then she told me he needed to eat raw food. I had no idea what that meant, but it sounded disgusting. But she had some incredible statistics on nutrition and the positive changes it made in animals lives, once they stopped eating all the junk in dry foods. If he won’t eat the raw, just feed him quality wet food, she told me. Both were fine with Tweetie. For an allegedly sick cat, he ate raw food on the first try - unusual, Dr. Martha said. In addition to the raw, she began treating him homeopathically. And miracles began to occur. His eyes got better. His breathing improved. He didn’t sound as congested all the time. His mood, thankfully, didn’t change - he was still as sweet as ever. And just like that, I was a believer. It wasn’t that he immediately achieved perfect health overnight. It’s been a long road, and sometimes he has setbacks. As I write this post, though, he’s sitting on my lap, happy as can be. He still eats raw food every day, and I know the difference it’s made in his health. He’s 11 now, and I look forward to him being around for a long time. That’s one of the reasons I’m so delighted for the opportunity to write the Pawsitively Organic Mysteries - I can use what I’ve learned, what’s helped my own animals, and share that with everyone. I’m so excited to be able to spread the word about natural, organic food for animals in a lot of future books. I hope it will make life better for a lot of our four-legged friends. 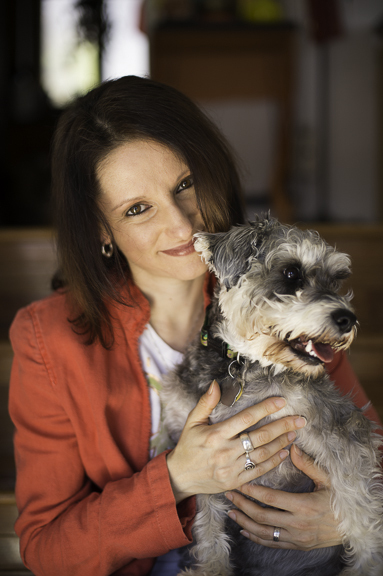 Liz Mugavero writes the Pawsitively Organic Mysteries. The first in the series, Kneading to Die, is on sale May 7. In her spare time, she looks for new, healthy food recipes for her own furries. Good luck with the new series, Liz. But raw food for cats is what exactly? Mice? Mine eats plenty. Hi Liz! What an interesting idea for a series! We did raw food for our dogs at one point--even bought a meat grinder--but found with two big dogs it was just more than we could manage. I'll be very interested to see how you've worked this into a story. Hi, Liz! I love the way you've woven your own experiences and the things you care about into this series. 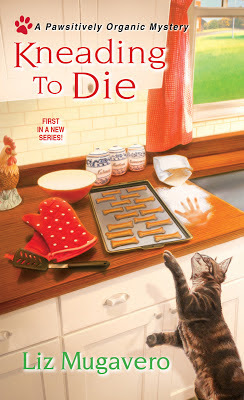 As a major cat lover and a serious foodie, this series sounds like it's right up my alley. So where can we find you, around and about, promoting the book? Thank you, Deb! Stan, my character, actually gets started by baking treats, but she'll be exploring the raw food based on demand as people (and animals) start to notice her food more and more. It's been a lot of fun to write. And thanks to my friends at Jungle Red for having me! You can find out more at my website, www.lizmugavero.com; and from there don't forget to connect with me on Facebook, Twitter and Goodreads! Liz, keep spreading the good (healthy) word! Such a sweet story about Tweetie! We discovered a vet in our regular veterinary clinic who treats with alternative care whenever requested and when it seems the appropriate way. So while she might treat with an antibiotic if the labs come back showing infection, she will look for a root cause that might be treated with different foods, supplements, or what is usually called alternative medicine. My service dog, Kendall, came to me with dry skin and mild itchiness. It got worse. When I took him for his next appointment, the new vet with an interest alternative medicine was available. She put him on a grain free natural diet, and his long-term skin problem cleared up within a couple of weeks with no medicine at all. Welcome, Liz! What an interesting idea for a series! You get the foodies and the pet lovers both. Smart! When my dog Mina was near the end of her long life, she couldn't handle commercial dog foods any longer, so we made raw food for her and bought some of the pre-made for her last year. Your book sounds fascinating. It's a definite addition to my TBR list. I love cats and have six. Glad everything turned out well because it started out sad.